Gardeners can grow citrus trees grow throughout many southern areas of the United States if they properly plant and maintain them. One important aspect of planting includes proper spacing between trees to avoid reduced citrus production, according to Purdue University. Generally plan on spacing citrus trees about 15 to 20 feet apart. You can plant satsumas and tangerines as close as 10 to 15 feet, according to the Alabama Cooperative Extension System, and kumquats, lemons and limes only 8 feet apart. Some trees need additional distance between them for best results, according to the National Gardening Association. 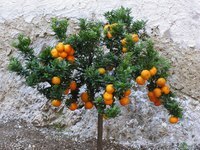 Plant orange trees 20 feet apart and grapefruit trees 25 feet apart. Plant dwarf versions of citrus trees if your space is limited. Leave 6 to 10 feet between each tree, according to the National Gardening Association. How Do I Know If My Orange Trees Are Dead?